So let's get into the basic idea: crossing the ideas of Mr. Roy Delgado and Mr. Tom Danley on horn design, namely using a K-402 as the basis of a multiple-entry horn design--like the Unity Horn design of Sound Physics Labs. Specifically, what I'm discussing is a cross between the K-402 horn used on Roy's Jubilee (the real secret of the Jubilee, IMO) and the multiple-entry horn design of Tom Danley--whose original Unity Horn patent has now expired. So neither of these topics are controlled by legalities except of course the names that may be copyrighted by Klipsch and Danley Sound Labs, so I'll just refer to this new design as my "New Center" design, since I'm currently using it between two 2-way Jubilees as a center loudspeaker. So the first question is: why? That's pretty easy: I needed a better center loudspeaker between my Jubilees, but the size of another Jubilee is not possible to accommodate in my room. So I reused the horn profile of the most important horn--the high frequency K-402 horn used in the Jubilee--in a full range loudspeaker design. How can you do that? Isn't the K-402 just a HF horn? Well, the answer is: no, it isn't only a high frequency horn. We'll get to that in more detail as time goes by. Suffice it to say that the K-402 is used, unchanged, in the KPT-305 mid-bass module used by the 4-way behind-the-screen cinema systems. This module goes down to about 200 Hz using only a puny 8" driver that Klipsch provides. So the K-402 horn is good from at least 200 Hz to 20 kHz. I was needing more low end than just 200 Hz, so I decided to try my hand at a multiple entry design that reuses the aperture of the K-402 for both the bass woofers and the apex-mounted 2" compression driver. 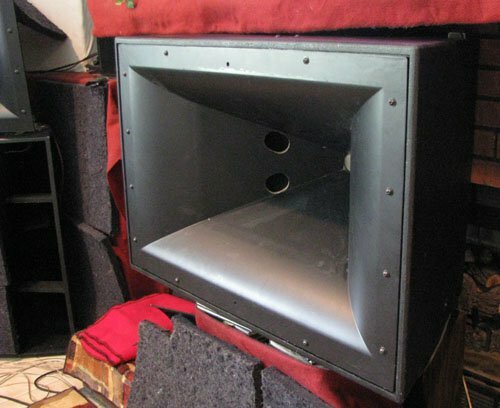 Basically, you take two or more woofers and mount them on the sides of the back of a K-402 horn and provide through holes through the side of the horn at the right places to provide a secondary entry point for the bass frequencies, while the rest of the horn behaves like a K-402 horn with 2" compression driver. Two for one, basically. No Jubilee bass bin is used. 2) I avoid the issue of dual-mouth bass bin polars at the crossover frequency that the Jubilee bass bin has. In fact I get the same polars all the way through the crossover region--something that is an issue for the Jubilee (refer to the EASE data for the Jubilee). I get full polar coverage up to and through 600 Hz and above. The Jubilee bass bin has issues starting at 200-300 Hz in this area due to its two bass bin mouths. 3) I don't have any folds in the horn. The advantages of this are many, and have been discussed in detail in the forum threads many times. 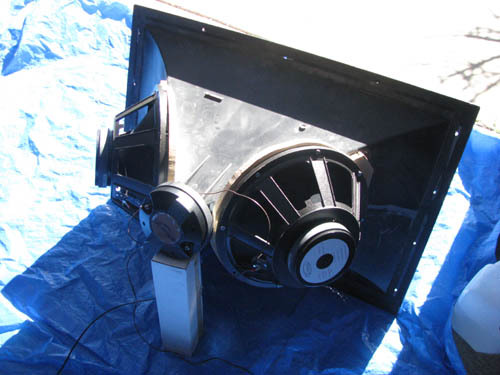 4) The cost of the center loudspeaker is about 1/3 of a full-up Jubilee. This isn't a trivial point to consider. It's also much less cost than Danley Synergies. 5) I don't need a corner of the room in the center of my setup to get good bass response, like the corner-located Jubilees need. Danley Synergies also have an issue in this regard (except the SH-96). 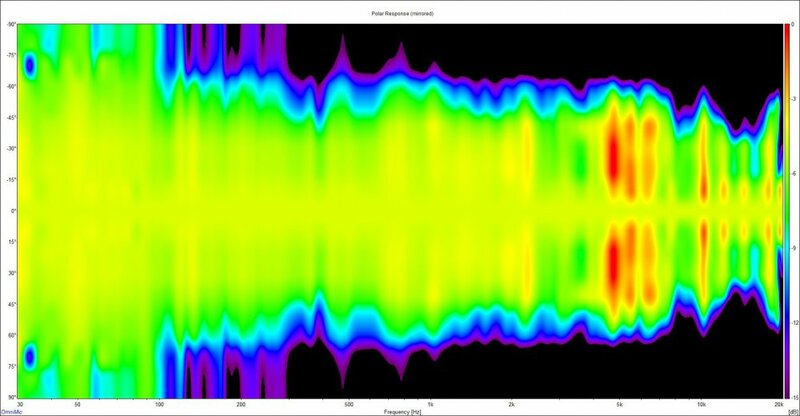 The -6 dB point is the blue-green color in this plot. 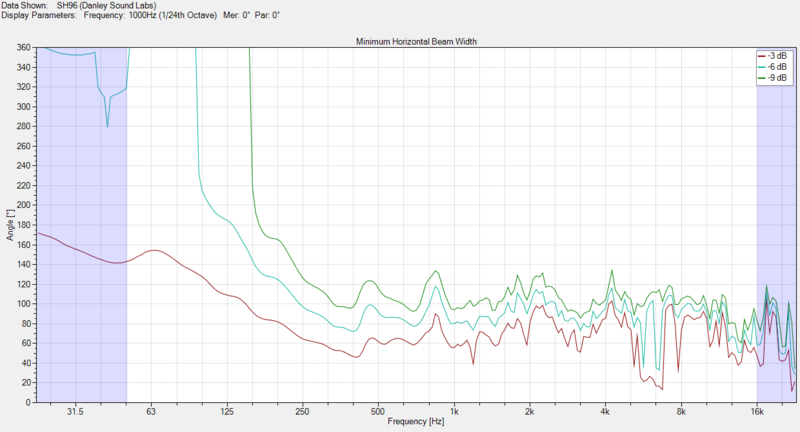 This is spectacular directional performance down to 100 Hz, which is solely due to the dimensions of the K-402 mouth. This is significantly lower than the nominal polar cutoff frequencies for virtually all other horns used in home consumer environments. The effect of having such low frequency directivity available is outstanding in-room performance and ability to couple to the boundaries without polar lobing effects much more effectively than even the Jubilee bass bin. This is outstanding polar directivity performance that I have not seen in any other loudspeaker. 6) All of these advantages will also work even better for those that might want to use this design instead of Jubilees in the corners--except in a package that is about 1/3 the size of a Jubilee--essentially the same volume and form factor as a La Scala II, and about the same weight (190-200 lbs). 7) You can use this loudspeaker in a vertical orientation--like the difference between a regular and vertical Cornwall--without having to change out the internal baffle. The horizontal coverage can then be 60 degrees instead of 100 degrees. Ceiling bounce issues can be controlled at the loudspeaker in this orientation. Why doesn't Klipsch do that already? Probably because the Jubilee is aimed at the Cinema marketplace, which requires much higher average SPL. Secondary to this have been the patent issues that have more recently been resolved by the expiration of the controlling patent. Why not use a Danley Synergy Horn instead? Well, price for one. And all the Danley products are designed for PA use - even higher SPL than Cinema. This means that the requirements that they have been designed to don't match the needs of the home hi-fi enthusiast, like myself. Additionally, the K-402 horn is a better horn than the Danley dual-flare conical horns, in terms of polar control and coverage angles. The Danley Synergies used at home have been the SH-50 or SH-60 designs, which have about half the horizontal coverage angle that I need in my listening room, and they have insufficient low frequency headroom relative to the modified K-402 with two 15" woofers. You would have to buy two Danley SH-96s to have two stereo loudspeakers, and those units apparently go for $8363(US) each--they have 11 drivers in each cabinet which is neither necessary nor useful for the home hi-fi enthusiast, and those drivers cost real money. This K-402 design is much more "fit for purpose" than any of the current Danley designs. Chris, why do you still use the Jubilee if the new center is... smaller, and better? Is there a downside to your new center? There are trade-offs. I'm evaluating them right now by thorough listening using surround sound music. It could be that the Jubilee bass bin isn't required for all home installations - especially those that have limited floor space, lateral width, and good corners. These "new center" units seem to be much less sensitive to corner loading. That's a pretty big deal for a lot of folks. If you want to pull these out on the floor out of the corners, you have sufficient LF performance out of the dual 15" woofers to do that quite well. You also don't have that "ported box sound" of the big KPT boxes: the sound is much tighter than Cornwalls and those other ported boxes, and can go toe-to-toe with corner-located Jubilee bass bins, surprisingly. I'm quite surprised by this. 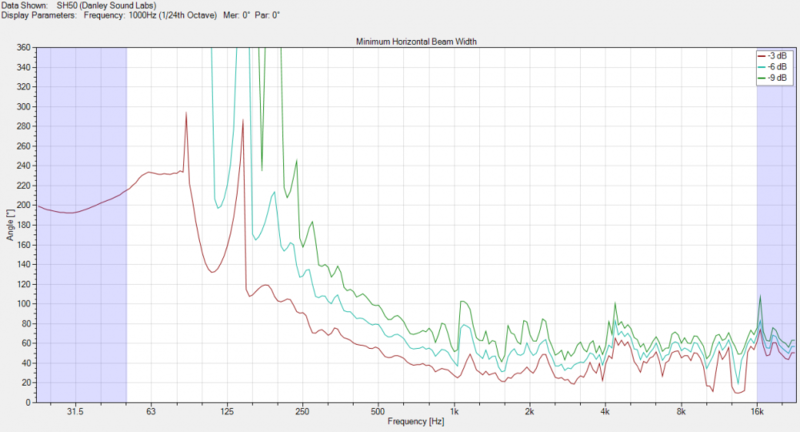 One of those trade-offs is that you really need to use a good active digital crossover: you're not going to get this performance using passive crossovers--although, this loudspeaker is time aligned within 45 degrees of phase, as-is, using an LR24 dB/octave crossover and no other delay or phase compensation. I'm currently evaluating flattening the phase response (shown above) a little bit more using the Dx38 that I'm using. The flatter that curve is, the better and crisper the impulse response. Nice work, Chris. It took guts to cut 4 holes in the K402. What modeling software did you use to calculate the location? How low does your Center Horn go? Do have magnitude response plots? Phase? Are you getting to 600 Hz. clean with 15's? How big of a box around them? I have waited to do this for about 6 months or longer, so I was motivated to get on with it. I used Hornresp to find the combined power response (i.e., that isn't SPL on-axis). Hornresp is actually more accurate than AkabaK at frequencies below 1 kHz, so I was fairly confident in what I was going to get. That information is shown in the figure above. 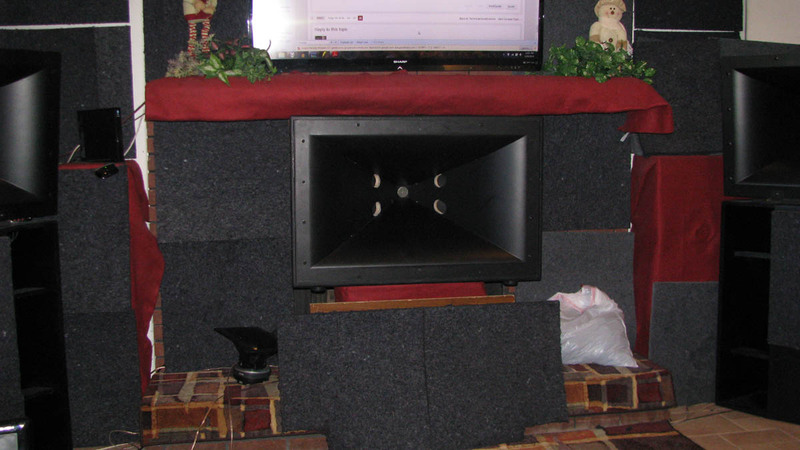 I would conservatively say that the chosen roll-off after EQ will begin at 40 Hz (just like a Khorn bass bin in a corner) but it will do this comfortably along a wall (like I showed in the picture, above). In the corner, it gets better - picking up an additional 5 dB of sensitivity on the bass bin overall. The dual 15" woofers were sized so that it would do that. It will even have good performance away from the walls, although you'll lose about 5-10 Hz of clean bass extension and about 5 dB of sensitivity doing that. The box is a KPT-305 box with the hole in the back closed up, as shown in the picture above. The crossover point was designed to be 475 Hz. It hit that right on the nose. In fact, the horn will play with no crossover at all, although the compression driver doesn't sound very good below 400 Hz. One thing that I should mention: the soundstage and coverage extend from wall-to-wall sideways (~16 feet in the front part of the room plus ~2 feet more at the bay windows on the left side). You can walk slowly across the room just behind the listening chairs and the sound image center doesn't change and the whole front wall radiates coherent sound. It gets even better as you walk back 25 feet or more (my listening room is about 40 feet deep), and the front-three loudspeakers image extremely well even up to within 2 feet of the mouth of the center. This is something that is absolutely spectacular. In home theater mode--I was really floored by the increase in sound quality and speech intelligibility over the tri-amped and time aligned JuBelle. We used to watch all our movies with the subtitles on (...my wife and I suffer from two different forms of audio processing "differences"--one type for her, a different type for me--that make it difficult for us to understand Limies talking on British flicks). Now we don't turn on the subtitles at all. It's really spectacular in that regard. I wouldn't have believed it unless I heard it myself. How would an elongated slot work compared to the two holes in the side of the horn? Oh, my; oh, my. What a great idea! I wish that it had occurred to me. You have actually built this? 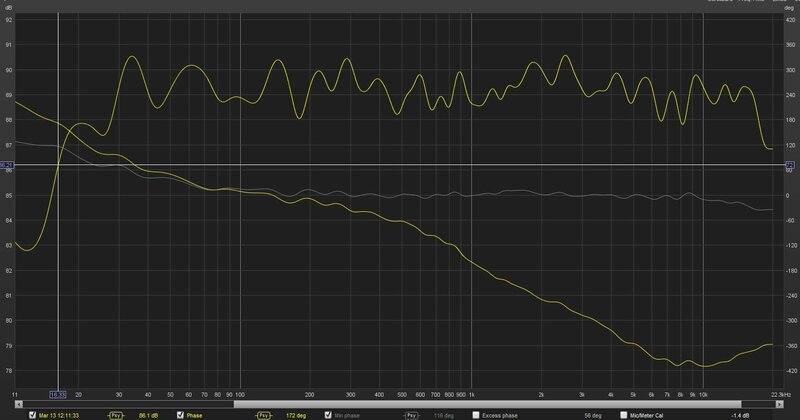 And your second graphic shows the actual low frequency response of what you have built? You are using two 15" woofers (which ones?) to feed the four entry holes in the sides of the K402? Are you stiffening and strengthening the sides of the K402 to handle the weight and vibration of the woofers? Are there backchambers on the woofers? Yes. The plot is from REW taken over the past two days of testing right in front of where I'm currently sitting. Note that you're seeing response after EQ in the plot. I'm not doing anything that Danley hasn't been doing for 15 years: trust me. Their passive crossovers have a boatload of PEQs buried in them--that's what Danley himself (the man) has been talking about - not phase flattening as he has been alluding to. Once you EQ the amplitude and crossover filters to flatten response, the phase falls into place I've found. Multiple-entry horns aren't conventional exponential horns--that's for sure. They experience horn/driver coupling not like traditional horn-loaded loudspeakers. The back chamber is the cavity volume of the KPT-305 box with K-402 horn, K-69-A compression driver, and two 15" woofers (Crites cast frame woofers). I used 3/4 inch mounting MDF for the woofers. I'm thinking about going in to stiffen the top and bottom more, but that's a little further down on my to-do list right now. I've got a lot to deal with right now. Hornresp showed me how insensitive the tuning was to back chamber volume, using the current selection of drivers and multiple entry horn configuration (two-way). I cut the back chamber in half, and doubled it in separate Hornresp trials: very little difference in output power levels vs. frequency. This was a big surprise for me. By the way, your prior Jubilee bass bin modeling in Hornresp helped save me a lot of time coming up to speed on the tool. The "multiple-entry horn wizard" user interface isn't what I'd call self explanatory--by any stretch. Thanks again for your Hornresp work. It's been valuable. Once I get everything nailed down a little bit more, I plan to publish my Hornresp model(s) for the current design, above. Also, the concept of "reactance annulling" in the back chamber doesn't work at all with tractrix horns, or apparently, modified tractrix horns. There may be some optimization work ahead for the back chamber volume, but in real life, everything I've read says "don't waste your time on that" when it comes to these type of horns. The design goals do not include "make it more efficient". That's been a big trap (apparently) for everyone trying out these type of designs. Don't worry about that part--would be my advice. I go more with Geddes on this subject: directivity is king along with providing some loading back to the driver, not efficiency/sensitivity--that's the hallmark of conical horns being used below Fc (i.e., ka << 1) that Danley has been doing. Input electrical power just isn't an issue--but having excess LF capability (Sd) in your woofers apparently is a really big issue. That's also what Danley has been doing for a long, long time. The issue is avoiding diffraction at the boundary of the woofer through-holes. I used guidance looking closely at what Danley has done with all their designs. They never put a slot all the way across a horn sidewall. I don't want to pay for that knowledge of going down that path right now: budgets are slim currently. I stayed on the well-beaten path for this design--low risk. I was rewarded for that behavior, I believe. I'll cast my alms to the horn gods at sundown for the success of the current design: I skated an edge as it turns out, and I should be thankful for what I got, I believe. With more expendable budget available, I can go find those answers. Not right now. although the compression driver doesn't sound very good below 400 Hz. Well I don't expect a Beryllium diaphragm to give me 20k AND 300 Hz. the K1133 does 300 but dies at around 5K. I'm not a huge fan of 12-15 db of shelving and amplify Titanium resonances. So my getting TAD's will mean no tweeter for the first time in decades! Which woofers did you use? I experienced the same thing when working on the Quarter Pie. 2x the back chamber volume just lowered the slight peak at cutoff, which would probably be inaudible while paying a huge size penalty in the process. Once you EQ the amplitude to flatten response, the phase falls into place I've found experimentally. That just means that the anomaly is minimum-phase, which isn't all that uncommon in the real world. I have found the same from many Hornresp simulations. Also, reactance annulment really only applies to exponential horns, and even then doesn't necessarily give the most desirable response. Back chamber can be too small or too large, but there is a great deal of latitude in-between. Well, having owned 14 Sound Physics Labs TD-1's in various configurations (down to 4 now for future surround duty), and one "Runt center" (traded for empty Danley sub cab)plus now having 3 identical Danley SH-50 Synergy Horns in front I TOTALLY concur with your observations. Vocals are spooky real and intelligible. OF course I had that with my old K-402's, so I'm curious about the new ones with TAD's. Can't wait to try that. In the meantime I do have high performance in place while I try to improve things a bit on the Klipsch side of things by going 2-way instead of 3-way like I had in Indy. A friend of mine suggested I try what you just did several months ago, but I didn't have the guts to cut holes in my precious 402's. I'm glad that you did. 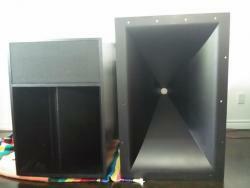 two 15" woofers (Crites cast frame woofers). More on the subject at a later date. I just bulled my way through it using the tools that I have on hand. It turns out that the holes aren't that sensitive (unlike the dimensions in the throat area). I'm already working on more efficient ways to do it.